So a year ago I had never been to Weeki Wachee Springs, the live mermaid city on Florida’s gulf coast, where one Newt Perry built an underwater theater into a natural spring back in 1947, and then filled it with mermaids. This seems unfathomable now that I’m a mermaid expert, of course, and have been there twice and read all about Weeki’s history and met some of the (very very glamorous) former mermaids who perform there once a month and who run the Sirens of the Deep mermaid camp that yours truly will be attending next month. Soon I will put up amazing interviews with said former mermaids, not to mention a whole bellydancing troupe that recently attended the camp. 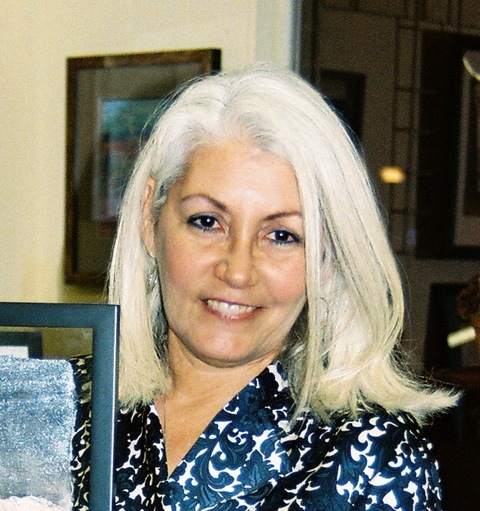 But right now I’m going to tell you about Weeki’s magical resident artiste, the glamorous Julie Komenda, and ALSO tell you about the illuminating event she and I will be doing together this very Saturday evening, May 7, at the Pier Aquarium in St. Petersburg, Florida. Julie and I will be talking about mermaidliness generally, and I’ll read from Mermaid and she’ll talk about her mermaid art and experiences at Weeki Wachee generally. 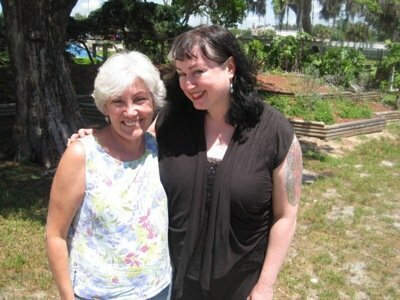 So I met Julie because, in a very magical not to mention convenient coincidence, she emailed me out of the blue a couple weeks before I was planning my first trip to Weeki, just to say that she liked my books and was excited for Mermaid and to say she was Weeki’s first Artist in Residence, etc. My mouth dropped open and I told her that as it happened I was about to visit Weeki for the first time, with mothers, uncles, grandmothers and sisters in tow. She ended up meeting us all at that gate and showing us around the park and even giving us a “backstage” tour so we could see where the mermaids entered the spring for the mermaid shows, and other mysteries. And it was Julie who put me in touch with about 50000 former Weeki mermaids, via mass email, once I decided to selflessly start this blog earlier this year. In short, I suspect Julie might have just done dropped down straight from heaven. Recently I sent Julie some penetrating questions about art and mermaid camp (which she shall be attending in June as well) and other topics of interest to mermaids everywhere. Her gorgeous responses follow. 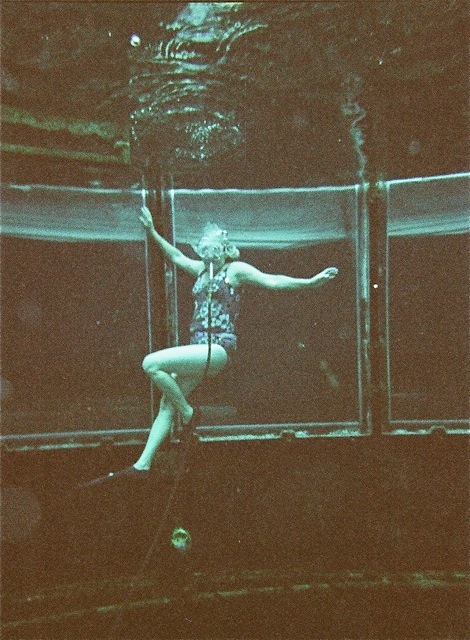 When did you become the artist-in-residence at Weeki Wachee? I think it was a state of mind first. I knew from the first moment that it spoke a language I only hear in my heart! At a time when the word Mermaid has become a verb, as in “to Mermaid,” it seems that there are more opportunities than ever to celebrate sirens through art. I recently organized a Paint-In at Weeki. 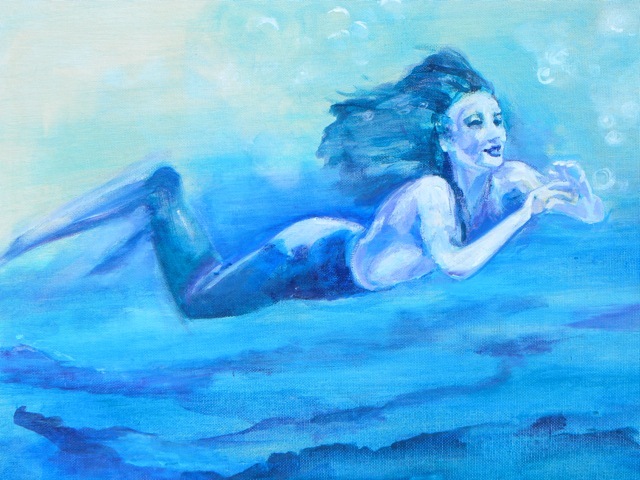 Lots of mermaid scenes and landscapes by our Central Florida community were created that weekend, and are now on display at City Hall in Brooksville. 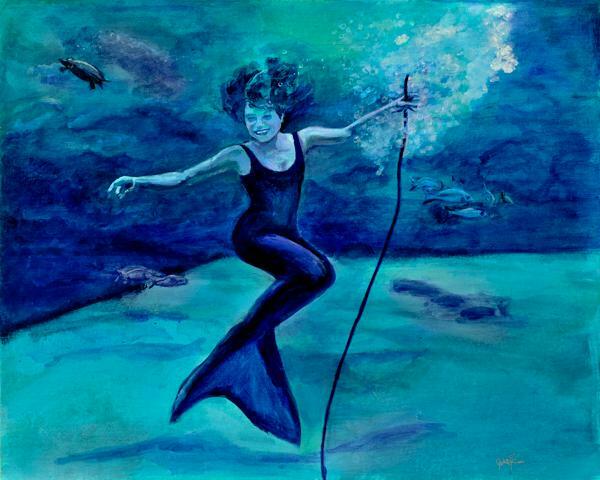 Actually, the whole show this month at the City Hall Gallery is devoted to Weeki Wachee. There is memorabilia there from the beginning, video courtesy of Mermaid Vicki, and a great acknowledgment of the contributions made by the Mermaids to Florida Culture. The response to the Paint-In and show has been wonderful – so next up I hope to get to plan a MERMAID BALL!! Well, we will see. But who doesn’t want to dress up in glittery, pearly, seaweed/shells/ buried treasurey things? And TAILS! Originally I had planned to write and sell a magazine article about the former mermaids. After interviewing them I was invited to swim in the Deep Hole at the spring. It was life-changing! The new perspective of floating over that bottomless, mermaid-filled natural wonder made me want to capture that moment forever. Imagine: I was numb from the cold, floating, attached to a safety device, tired, breathless, and exhilarated at the same time! Down below me mermaids and scuba divers were zipping by the stage of the Mermaid Theater, and below them was mysterious deep. I felt like I was flying! Mermaid Vicki was cleaning off something from the cavern walls like she was in her own back yard, a walk in the park, just with an airhose, mask, and flippers. She was surrounded by people in full scuba gear, which made her look mighty natural. That is when I knew I had to transform…! I nagged my way in through art and asked if they had any projects I could work on, beginning in 2009. Since Weeki Wachee had become a Florida State Park, it seemed like a great opportunity to get the community involved with an art project. We had artists come and paint for the Halloween and Christmas shows and continue today. Have you always painted mermaids? No. 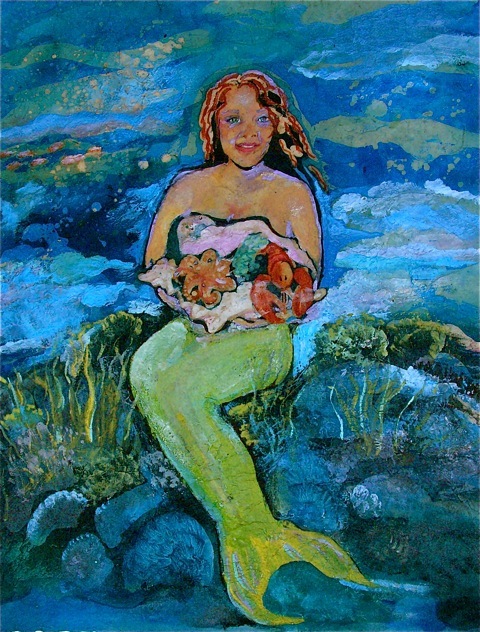 I only started painting mermaids after I interviewed them, in 2006. My mediums are batik on paper and acrylic – water mediums for water people. I paint athletes, fire, bees, landscapes, life-cycle stuff. I am just now finishing a commemorative piece for a women’s volleyball team. I painted a horse for Rockland Industries, who make the canvas I use…next up a king-sized piece to be quilted for the Houston Quilt Market. Mermaids in Texas? Maayyyyyyybee! What attracted you to mermaids, and what do you think their appeal is generally? Okay, I’m fessin’ up – it was the aging process! I guess I had being a mermaid in the bucket and was thinking that I might not ever feel comfortable in a swimsuit again, let alone attempt swimming athletically. I wanted to do the article as a way of exposing myself to my fears… and it has become a template of behavior for me. I was afraid of bees, so I went to the beekeeper to face them. Seeing the Former Mermaids perform was absolutely profound. Not just about being a mermaid, but about acting on your passions. Mermaids Barbara and Vicki inspired me with their grace and encouragement to swim, paint, write, act. Being a mermaid is a big-picture kinda thing. It’s you and the river, babe, sink or swim. I will be 60 next year, and possibly the oldest camper. As for art, well, of course their beauty is a wonderful thing to try and interpret, but the underwater environment combined with unrestricted movement produces some interesting possibilities for light, color, and position. I have a background in English Literature and have always loved mythology. The Siren is an archetypal image that incorporates danger, beauty, risk, choice, longing, and freedom. When the mermaids at Weeki Wachee perform they trump the legends! In that Fountain of Youth they are ageless, graceful, dignified, athletic and everything people want to see – something magical that there may be an explanation for, but one that you are happy to put on hold! How would you describe the difference between mermaids and humans, having met so many of both? Muse Creation Fusion Dance bellydancers/mermaid campers... interview with these ladies to come! The line is so blurry! Watery, even! The Friends of Weeki Wachee Citizen Support Organization sponsors a “Sirens of the Deep” Mermaid Camp for adults, soon to be attended by a certain “Mermaid” authoress and moiself. I helped out at the last one, taking photos and assuring myself that with so many Former and Current Mermaids around I would be glamorous and still not drown. There were four awesome Mermettes that belly-dance together at this session. They were charming and gorgeous and came loaded for bearfish. I mean, they had made parts of their Mermaid accoutrements with decorated hair accessories, jewels, tops, and ‘tude. The pix were great because they were so prepared and comfortable in the tails. I have to believe that there was a mermaid in each of these women ready to come out at the drop of a fin. And there are many more! Why, I’ll bet there is a run on turquoise eye shadow this year! Wonder if I can get away with full makeup…I am going to practice breathing and smiling. We have new tails for campers that are a royal blue so I will be looking for shells and stuff for my gray/white hair, some kind of forgiving top, and new makeup. I was thinking scales and gills, but maybe just scales and giant eyes like the anime/manga girls do with oversized contacts. And I will practice singing, since the mer-hag just may try to steal my voice. Or I could just do the whole Mer-hag thing and grow tentacles, like Queen Latifah. I love the idea of being a mermaid/environmentalist. 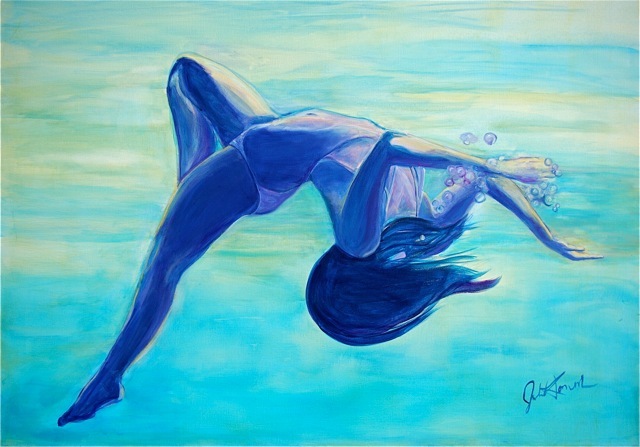 Our Weeki Mermaids all know the spring’s water, down to the flow and pressure. They are all scuba certified. Spokesmermaids, even. It comes with the territory, and from Hernando County to Australia, the idea of protecting our aquatic environment is a perfect fit. My part in that plays out in painting underwater scenes that come from a mermaid’s point of view, from the surface to 60 feet below, pointing even further down. I get thirsty just thinking about it! Mermaids are a sisterhood with their own rules (governed by environmental restrictions, as well as fairiedom, in general.) They are somewhat egotistical as great beauties with Siren powers of persuasion, but capable of great sacrifice when called upon. (Here at Weeki Wachee, they are wonderful, kind, generous, and amazing in general.) Humans tend to be more wishful, unaware of the special powers they possess, and have difficulty seeing magical potential in the mirror. Seeing life from the other side of the glass makes me want to jump in and join them. When I am painting I am in my own magical environment. Everyone needs to find their own – and swim! Do not be afraid. Take care of yourself inside and out, as if you were going to run a marathon…which you are – life! Wear wonderful colors, live vividly, and bathe often. And if you dare, come to Sirens of the Deep Mermaid Camp at Weeki Wachee Springs, Florida! I am so thrilled to see this! Thank you, MerSistah! I have met Julie and she is as sweet as she is talented and beautiful. Her art is awe inspiring, I love her work! Can`t waite to see what she does next. Jo, what a lovely thing to say, I am so honored! To my mersisters: well coifed, world famous artist, Carolyn Turgeon and glamours, Weeki Wachee resident artiste, Julie Komenda…this I say to you; “Dive into our water world of liquid silk that will adorn you with rivulets of silver and diamonds then drift deep into the blue green heart of its ancient rushing river and listen…hold your breath and listen.” It’s magic. I am breathless–what a beautiful quote! What a wonderful article! 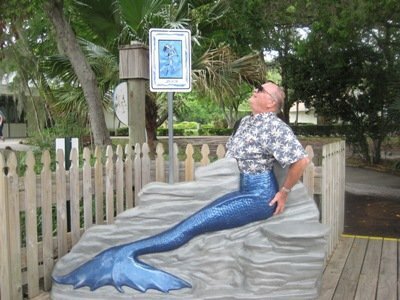 I too went through the transformation of man to “Merman” which was a dream of mine since I was a boy in third grade and visited Weeki Wachee on a field trip. After reading the book “,Learning to Fly” by Sam Keen I decided at age 60 to take the plunge and go for “The Dream”…..It took 2 yrs. with documentation of the whole process including magically receiving a tail. The Dream came true and when I read Vicki Smith’s comment to you on the rivulets of silver and diamonds and hearing the sound of magic underneathe that glorious spring I am tempted give a mermans scream of delight . Congratulations on your achievement! Wear that tail proudly–the magic was that you gave yourself permission to do just that–Salute! I am a Hernando county resident, book lover, and mermaid lover. I saw your book in Target the other day and loving all things mermaids almost picked it up. I chose to wait, but then I saw it on goodreads and checked out your fan page. This is when I saw the familiar mermaid pose that all residents in the area have posed for at least once. My sisters and I have been going to Weeki Wachee since the early 70’s and still hold our love of mermaids. Oh my goodness…this post is mermaid kismet in action! Carolyn, I only just found your site & this post today, so I missed the St Pete talk. I’m not that far away, in Holiday/Tarpon Springs…please say you’ll have more mermaid-y talks in the area soon! I did not realize such mermaidiness was happening locally.